Exactly when to do an oil change on Beetle, Bus or any aircooled VW, depends on how obsessional you are and how many miles you do regularly. The best advice I've had is every 3,000 miles if you want to keep your car in tip-top condition, especially if you do lots of short journeys. If you've just bought your car or have had it a while and have no idea when the engine oil was last changed, it's definitely time to do it. 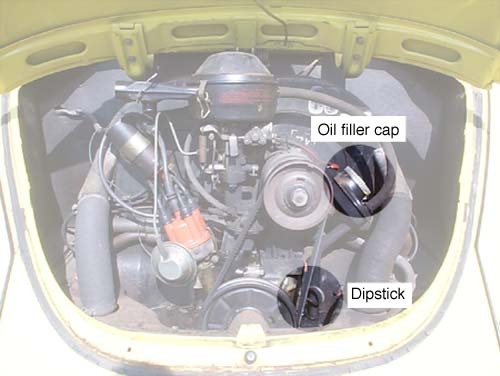 Here all the pictures are of me doing the change to my 1968 Beetle, if you have a different era car, it's worth checking if yours is different in something like the Muir book, and making sure you get the right filter kit from your supplier. We're going to drain out the old engine oil, unbolt the oil filter, fit the new one, bolt everything back together and pour in the right amount of new oil. I was advised to have the car on the flat when draining the oil out, which makes the whole process more awkward. If you have a way of doing this with the car raised up, but everything level, go for that as it'll give you more room to move. If your car is lowered you're definitely going to need to raise it up somehow because it's very awkward doing this when the car is stock height, so you'll have no chance. It helps if the oil is slightly warm when you do this, so a couple of runs around the block wouldn't hurt, but you don't want to burn yourself on the exhaust pipes while you're messing around, so go for a run and then let the car cool down for twenty minutes or so. Once you're sure it's cool enough to be safe, put your blanket on the ground behind the car and lie down on it. Find the plate that holds the oil filter in place. 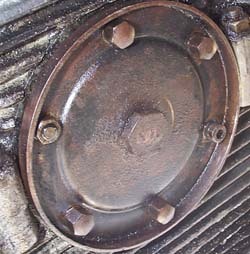 It's a round plate with six bolts around the outside, and a larger bolt in the middle (at least on my '68 Beetle.) Now spread some old newspaper or cardboard around on the floor beneath the plate, this is for later when we have oil falling out of it. The middle bolt in the plate is the one we're interested in right now, when that's released it will let all the old oil out of the system. Get your adjustable spanner and put it on the nut, adjusting it to the right size, and loosen it just slightly, you don't want to do it all the way and have oil dripping out yet, but it's easier to get it a bit loose now before the oil tray is in the way. If you don't have a central bolt in the plate, then I'm afraid the only way you're going to get the oil out is to unbolt the other bolts, and you're going to get messy. 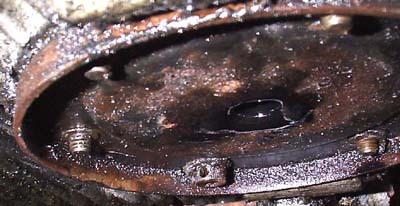 Once you've got the centre bolt loose, get something to catch the oil when it comes out. What you need is something low enough to fit under the car and big enough to catch about two and a half litres of oil (that's 2.6 US quarts or just over five pints, according to Google.) Traditionally, this is an old oil container from a previous change, on it's side with a hole cut in it (don't forget to screw the cap on,) or an oil tray which can be later cleaned. More traditionally, this is the roasting tin from the kitchen, but that's a good way to make sure you never have a roast again, especially if it was given as a wedding present. Having none of these things handy, I got a cardboard box, cut down the top until it was low enough to go under the car and lined it with a decent bin liner, so later I could gather up the top and take it to the dump (they have oil recycling places there, don't just stick this stuff down the drain.) The proper way of handling this is to pour the oil back in to (another) old oil container and take that to the dump. OK, so you've got your oil catcher underneath the car. 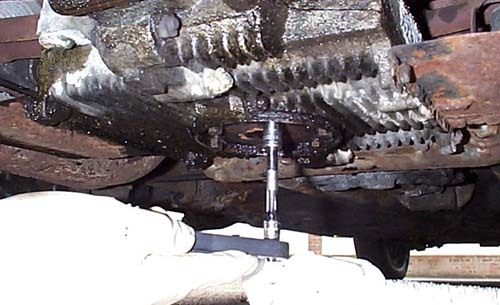 Make sure the rag is handy, and use the spanner to loosen the centre nut all the way out. It might drop in to the oil, don't worry about it, you can fish it out later - that's where gloves come in handy. Use the rag to clean the end of the spanner that's now got oil on it, and the bolt that came out if you managed to catch it. The oil will take quite a while to drain out, probably a quarter of an hour or so. That means it's time for a nice cup of tea, or work out if you've got grease all over your camera in my case. If there's still oil dripping out after a quarter of an hour, leave it for a while longer. The more of the old, dirty oil that comes out the better. Once the oil has stopped dripping, carefully pull the tray out from under the car. Don't do it quick enough so the oil slops over the edge, as you'll only get it all over yourself in a minute when you're unbolting everything. Once the oil is safely out of the way (i.e. you can't kick it when you're faffing about under the car, and the cats can't get in it) reach under the car and start unscrewing the six bolts around the filter plate. Make sure there's still some newspaper under the car as there will be drips, and more spilt oil later. My car was a bit awkward, I've got five nuts (four with the same heads, one a replacement) and one long bolt on my car. I've been advised this is because a previous owner has lost a stud and I need to replace this, which I'll do on the next oil change (thanks Chris.) The current bolt is quite smooth and takes an allen key head, which I didn't have. Fortunately it had a hole through the side of the head through which I ended up sticking a small nail, then used a small adjustable spanner to get it loose. Lots of swearing was involved in this process so before you start something similar make sure you know whether you have one of these things and that you've got the right tool for the job, or that it doesn't matter how blue the air gets. OK, easy and annoying bolts undone, the filter plate is still stuck to the car. You need to pull it down off the car, best done by sticking things in the hole in the middle and levering it down. I used a flat-head screwdriver, then some mole grips on the edge of the hole when it came down a little bit. When it eventually comes loose you will get oil over yourself and the ground. When the plate comes loose, it might bring the old filter with it. If not, you should be able to pull it out of the big hole the plate has revealed. If there's definitely no filter in there, curse the previous owner of the car and think about getting a voodoo doll made of them, it will distract you from crying that your engine might have been damaged by contaminated oil not getting filtered. Use the screwdriver to scrape any old seals off of the car once the filter is out, then also scrape any residual seals off the filter plate. Be careful not to scratch the case with the screwdriver when you're cleaning it, as that gives a way for the oil to escape. Give the plate a general clean-up and open up your new seal kit. There should be two cork or cardboard seals (gaskets) which fit either side of the flange around the base of the filter (i.e. the bit that sticks out with holes for the bolts to go through.) Within the seal pack there is also a new washer for each of the bolts, so clean the bolts up and give them all a washer ready for when you put it all together. Note: a friend in the same VW club as me uses the original VW gaskets either side of the filter. He says he finds he doesn't get any leaks with them and just cleans them every time he does an oil change. If this is your first time doing an oil change, it's probably worth getting the fitting kit even if you don't use the gaskets, just in case you do need them. Putting everything back together is a bit fiddly. I think in the end my successful way was to put the long bolt (the one I've got with the funny head) through the metal plate, seal, filter, and final seal, then faff about under the car trying to keep it all lined up while I slot the bolt up in to it's hole and get the other five bolt heads through their holes at the same time. This is one of those fiddly jobs that's just annoying as the seals are large enough to push the plate away from the bolts while you're trying to get it on to them. Once you finally have a couple of nuts over the bolt heads, it soon becomes a matter of putting them all on loosely, then gradually tightening them up. Don't tighten one all the way, go around them gradually tightening them all up, it helps keep the seals doing their job. For other bits of the car you're advised to do one bolt, then it's opposite, then another bolt and it's opposite until they're all done and start again, so I did that with the plate. It takes a bit of time, but if it keeps the seal good it's all worth it. I was worried about over-tightening one of the bolts and potentially stripping the thread (damaging the thread on the bolt or nut - this can be very awkward to fix, especially if the part that gets damaged is attached to the car and involves removing lots of things to replace it.) Eventually I got all the bolts as tight as I felt they could go and left it at that. A week or so later I found I was getting spots of oil beneath the car, so I tightened them a little more, and once more for one bolt (the awkward one, I think) a week or so after that. With the plate back in place, re-fit the big bolt in the middle, don't forget the new washer for it from the seal kit. This doesn't have to be as tight as the smaller bolts, but you want it tight enough to both stop the oil coming out, and not to get loose over the next year or so while you're driving around. Centre bolt back in place you can breathe a sigh of relief and get out from underneath the car. Have a stretch, enjoy it! Now you need to fill the engine back up with nice, fresh oil. When you buy the oil make sure it's OK for older engines, you don't want any of the new 'magnitex' stuff, which is not made for engines that use the oil for cooling like your VW does. You want to look for words like "for basic engines" and '15W/50.' If you live somewhere that gets very cold in the winter, find out what other local air cooled VW owners use, as sometimes you'll need a different type in the winter to help the car fight the cold. Pour the oil in to the oil filler pipe next to the engine. Every now and then check the dipstick to make sure you're not putting too much in. It's not worth starting to check the dipstick until at least two litres (about two quarts) of oil has gone down the tube in to the engine, and even then it could be a while before there is enough oil to register on the dipstick. 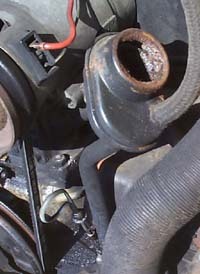 The picture above shows where you put the oil in, and the dipstick is pulled up a bit to point out where it is. Checking the dipstick: To check the dipstick, pull it all of the way out of it's holder, wipe it clean on a bit of rag, put it back in, give it a little twist and pull it back out. On the dipstick are two marks, in my case indentations across the flat side of the dipstick. You want the oil to be somewhere between the two marks - the lower mark is the lowest limit the oil should go to, the highest is, you guessed it, the highest limit. Above or below isn't good for the engine, so try to get in-between. It can feel like you're putting the world's supply of oil in to the car and nothing's coming up on the dipstick, but it will eventually, keep glugging some extra oil in and check the dipstick regularly. If you've put lots of oil in and you're sure it should be showing on the dipstick, have a look under the car and make sure you're not decorating the ground because one of the bolts is missing. Once you're happy with the level of oil in the engine, put the cap back on the tube that takes the oil and wait a while for the oil to get everywhere it's supposed to in the engine and the rest to get to the sump. Stick some fresh newspaper under the oil plate, then go and have another cup of tea, perhaps even a small cake. When you come back, check the dipstick again and if it's OK, check underneath the car. If there are drips on the newspaper you'll have to decide whether they're just spilt oil from filling the engine, or if they're dripping from the oil plate you may need to tighten up the bolts a little more. Finally, you can start up the engine, and listen to the purr of new oil. All right, the lessened rattle. Have a drive up and down the road and see how things feel, and try not to knock over the tray of oil when you pull back in. It's worth putting some newspaper under the car for a few days to make sure nothing's dripping, but other than that, you're done. One oil change, out of the way. Thanks to Chris P and Mick G from Edubs for their advice on the original version of this article.